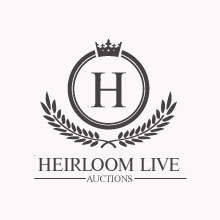 In business since 2007, Heirloom Live Auction has a track record of remarkable success in the online auction business, so we know what works and what doesn't when it comes to shopping and selling online. Thousands of buyers from around the world have shopped with us for antiques & art, furniture, vintage collectibles and jewelry. We understood that an amazing new worldwide market brought antiques and arts to the spot and we felt the need to assemble a special team that have been working in this new market for 10 years now. We can assure you a friendly service focused on results and responsibility followed by our passion for art and antiques just like you.